1 - Music.2 - I Can Only. (feat. Alessia Cara)3 - F*** Apologies. (feat. Wiz Khalifa)4 - FAB. (feat. Remy Ma)5 - Mad Love.6 - Vibe.7 - Honest.8 - Like This.9 - Edibles.10 - High Heels.11 - I Am. 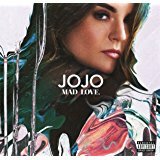 Unboxing: Jojo - Mad Love. Sorry, there are no comments in your language.